What if a brachiosaurus needed braces? 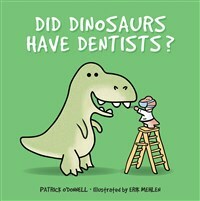 If a tyrannosaurus used toothpaste, would it squash the tube? A young child on the way to a dental checkup wonders if dinosaurs ever had cavities and if they had to brush their teeth, floss, get braces, and use fluoride or mouthwash. This whimsical picture book includes eleven common terms related to dental and oral health, along with a glossary of name pronunciations and fun, scientific facts about each of the eleven dinosaurs mentioned in the story. It takes an imaginative, humorous look at dinosaurs' dental health and eases children's fears about going to the dentist, while cleverly encouraging them to take care of their own teeth. Content writer, author, editor, social media specialist, lover of words.